The chapter is designed to provide online instructors with strategies and techniques for fostering greater cognitive presence in asynchronous online discussion forums. Online discussions, moderated and facilitated by instructors and students, are a staple in online learning environments and provide powerful mechanisms for engaging students in dialogue. However, oftentimes dialogues stall out at the initial inquiry stage, and deeper, critical thinking is neglected. Realizing the foundational nature of discussion forum activities, the authors present ways in which instructors can nurture cognitive presence and foster deeper lines of thinking in online discussions. The chapter outlines the four stages of cognitive presence while offering strategies and question prompts to engender cognitive presence in online discussions. A quick reference guide is included as a discussion aid, suggesting ways to recognize the stages of cognitive presence as well as providing question prompts for engendering greater cognitive presence and critical thinking. Discussion forums provide a foundational activity for online and blended courses, but many online instructors struggle with the challenges and time commitment of facilitating online discussions, and seek strategies and techniques that foster greater cognitive presence. The concept of cognitive presence emerges from The Community of Inquiry framework. This theoretical framework, originally put forth by Garrison, Anderson, and Archer (2000), offers lenses through which researchers and practitioners can examine various aspects of online and blended teaching and learning, which utilize both face to face instruction as well as online or computer mediated instruction and activities. 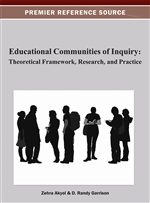 The original intent of the Community of Inquiry (CoI) framework was to guide the use of online learning environments in support of critical thinking in higher education (Rourke, Anderson, Garrison, & Archer, 2001). A central tenet of this model is that online learners form a community which has the ability to engage collectively in worthwhile and meaningful activities and discourse, in turn creating deeper and more meaningful learning experiences. Garrison, Anderson, and Archer’s (2000) model offers three interdependent and overlapping constructs which support and inform online and blended learning practices and pedagogy. Those constructs are social presence, teaching presence, and cognitive presence. The concept of presence is not new and in the context of blended and online learning environments it generally refers to a sense of being there and available, although the learning environment is virtual. Lombard and Ditton (1997) described presence as the illusion that a mediated experience is not really mediated. Non-mediation according to the authors, provides an “illusion” that the communication medium is not present in a learner’s communication environment and that this illusion causes the learner to respond as if the medium or manmade technology was not present (Concept Explication section, para. Presence Explicated). Riva (2009) described presence as a “core neuropsychological phenomenon whose goal is to produce a sense of agency and control” in an environment that supports users and their intentions (p. 159). Online presence in essence refers to one’s ability, whether student or instructor, to project a human sensitivity, warmth, and intimacy into an otherwise computer mediated environment, void of the tonal, visual and verbal cues found in the traditional classroom. Social presence is defined as “… the means by which online participants inhabit virtual spaces and indicate not only their presence in the online environment but also their availability and willingness to engage in the communicative exchanges which constitute learning activity in these environments” (Kehrwald, 2008, p. 94). Garrison et al. (2000) describe social presence as the ability to project oneself as a real person (one’s full personality) both socially and emotionally in the online environment. The categories of social presence, as defined by Garrison and Arbaugh (2007) are affective expression, open communication, and group cohesion. Teaching presence as defined by Anderson, Rourke, Garrison, and Archer (2001) is “…the design, facilitation, and direction of cognitive and social processes for the purpose of realizing personally meaningful and educationally worthwhile learning outcomes” (p. 5). Based on this definition, the authors distill three components or elements of teaching presence: instructional design and organization, facilitating discourse, and direct instruction. The third construct of the Community of Inquiry framework is cognitive presence. This chapter explores cognitive presence in detail; what it is, what it offers as a way of critical thinking, and how to engender more of it in the online learning environment.